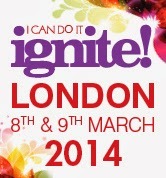 I Can Do It Ignite!, an event in London from 8th – 9th March, is a showcase of young and savvy teachers and authors in the wellbeing and spirituality arena, pictured above. The organiser, Hay House, has also offered a superb competition prize of five books by the Ignite! speakers for readers of A Bad Witch’s Blog. The talks and workshops at Ignite! will offer inspiration and guidance on living an abundant, healthy and spiritually engaged life - from addressing your relationship with money to learning to trust your intuition. With a combined social media following of over 1.2 million the speakers already have a worldwide fan base, but this will be the first time they have spoken together on one stage. The line-up includes: Gabrielle Bernstein (gabbyb.tv), Mastin Kipp (thedailylove.com), Kate Northrup (katenorthrup.com), Jessica Ortner (thetappingsolution.com), John C. Parkin (thefuckitlife.com), Robert Holden (happiness.co.uk), Pam Grout(pamgrout.com), Meggan Watterson (megganwatterson.com), Kyle Gray (kylegray.co.uk), Joseph Clough (josephclough.com),Sandy Newbigging (sandynewbigging.com), Charlie Morley (charliemorley.com) and Shaa Wasmund (shaa.com). Ignite! is intended as an urban retreat to bring harmony to your mind, body and spirit; a chance to stop, reflect and reconnect with your needs, desires and dreams. It is a weekend just for you: to explore new ideas, to learn new techniques, to connect and to totally nourish your soul. To enter the competition, all you have to do is answer this question: Which of the following can you expect to learn at I Can Do It Ignite!? Please email your answer to badwitch1234@gmail.com. The competition is open to anyone with a UK postal address, and don't forget to include that address on your email so Hay House will know where to send the books if you win. There is one prize, which is the five books stated above, and the winner will be picked at random from the correct entries. The closing date for the competition is Friday, 28 February, 2014, at midnight.